The shattered remains of planets that bear a striking resemblance to our own Earth have been found around white dwarf stars – offering a vision of what will one day happen to our planet. 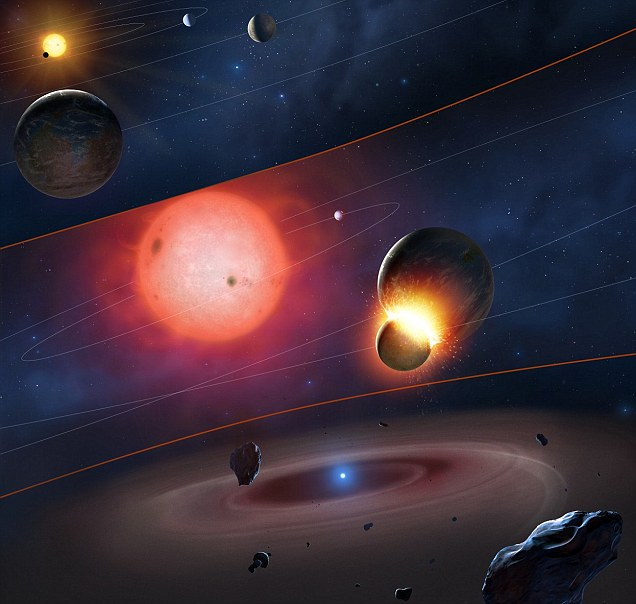 University of Warwick astrophysicists found four white dwarves surrounded by the dust of shattered planets. White dwarfs are the final stage of life of stars like our Sun – once the thermonuclear furnace inside a star ‘burns out’. Using the Hubble Space Telescope to carry out the biggest survey to date of the chemical composition of the atmospheres of white dwarf stars, the researchers found that the most frequently occurring elements in the dust around these four white dwarfs were oxygen, magnesium, iron and silicon — the four elements that make up roughly 93 percent of the Earth. It’s evidence that the small, dense stars are surrounded by the ‘corpses’ of worlds they’ve ‘eaten’. At least one of the stars is in the process of sucking in the planet’s core – rich in iron, nickel and sulphur – at a rate of around a million kilos a second.